Don’t know what took me so long — the Duchess was introduced to commerce in 1894. And she possesses many assets, including profuse flowering from late July to September, and thereafter showy golden pinwheel like seed heads. The plant blooms on new growth and once established can grow 6-12 feet after hard pruning in the Spring. 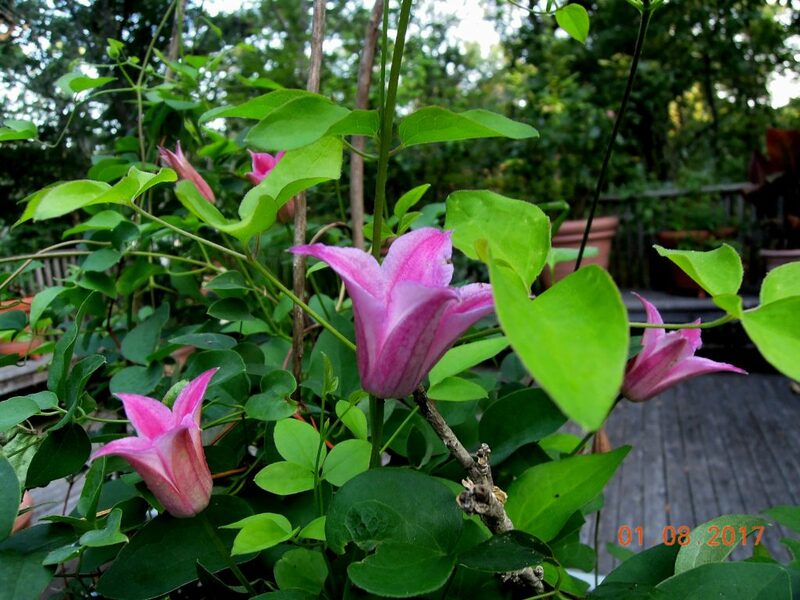 Moreover, the vine is so hardy and easy-care that it is on the International Clematis Society’s “Clematis For Beginners List”. Provide rich, well-drained soil, and water on a regular basis. With adequate support, the Duchess grows well in the ground or in a container. 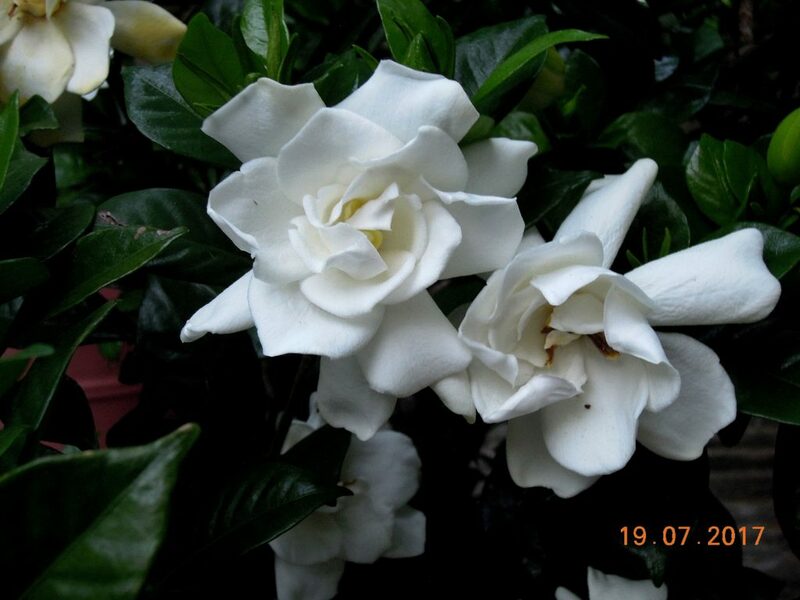 Before Chuck, I tried about 7 or 8 different gardenias and none survived . Then ten years ago Chuck arrived on the scene with the promise of cold-hardiness in my U.S. East Coast Zone 7. But when winter frost arrived that first year, I was so taken with the plant’s beauty and fragrance I rushed Chuck indoors to safety — and put him back outside the following June when the danger had passed. That’s been the modus operandi every year since. My organic garden’s health relies heavily on beneficial insects and birds to control the damage caused by pests. Needless to say, those garden helpers don’t live in my house. I was taking a risk with Chuck since many other house plants didn’t make it. But he surpassed all expectations: No pests and no disease. A Super Hero! Chuck is an evergreen shrub with deliciously fragrant double flowers from July to October, and lustrous, dark green foliage. He flourishes in a large container with acidic soil and regular water. He does grow quite big–about 3 feet tall and wide-and I’ve had to prune him back a couple of times. I have been tempted to leave him out over winter, protected with conifer branches — the method I use with container roses — but these days Mother Nature has been too crazed and erratic. Maybe someday. This entry was posted on August 12, 2017, in Autumn Fruit and Color, Flowering Shrubs, Fragrant Plants, Organic Gardening. Bookmark the permalink.